Last month I decided to join a new blogging event called the Fantastical Food Fight. It’s hosted by Sarah of Fantastical Sharing of Recipes . Each month there is an ingredient or theme and bloggers can make any recipe that fits under those guidelines. I made an ice cream base last month using almond milk and unfortunately when it came time to put it in the ice cream attachment of my Kitchenaid, I realized it had curdled. There wasn’t enough time to make a new base so I begrudgingly had sat out and vowed to make a recipe far enough in advance this month to actually be able to share with everyone. The theme for this month is rum and my first thought was “Hey! Right up my alley!” I searched through a ton of different recipes trying to figure out which to make for this and eventually ended up settling on a cake recipe that I found on Inside BruCrew Life. I’ve had some serious cake making fails recently (more about that tomorrow) so I decided to follow the recipe nearly exactly (replacing unsweetened applesauce for oil and coconut flavored rum for light rum or rum extract) to reduce my chances in cake failure and not being able to participate. Key Lime Coconut Rum Cake is a light layer cake made with key limes and coconut rum. 1. Preheat the oven to 350 degrees. Spray 2 8-inch baking pans with baking spray or grease and lightly flour. 2. In the bowl of your stand mixer, combine the white cake mix, eggs, milk, sour cream, applesauce, key lime juice and key lime zest and mix on low speed until fully combined. 3. Divide the batter in half and pour each half into the prepared baking pan. Smooth the batter on top and tap the pan on the counter to remove any bubbles. 4. Bake the cake for 25-28 minutes or until lightly golden and a toothpick inserted in the center comes out clean. 5. Transfer the cakes to a wire cooling rack to allow to cool. 6. Prepare the glaze by adding the butter to a small saucepan over medium heat and melting. Whisk in the sugar and key lime juice, whisking until the sugar dissolves. Remove from the heat and whisk in the coconut rum. 7. Prick holes into the cake with a fork or toothpick and pour the glaze on top, allowing it to soak down into the cake. Let cakes soak for 10 minutes. 8. Run a butter knife around the edge of the cake and invert over a plate. Repeat with the second cake. Cut off the top layer of the cake to make it even, if necessary. 9. Prepare the frosting by combining the softened butter and shortening together in the bowl of a stand mixer and beating on medium high speed until light and fluffy. Add the coconut extract and coconut rum. Slowly add in the powdered sugar ½ cup at a time, alternating with the coconut cream until both are used and a thick frosting has formed. 10. Spread a heaping layer of the frosting on top of one of the cooled cakes. Carefully lift up the other cake and place on top. Add more frosting to the top of the cake, leaving the sides naked. 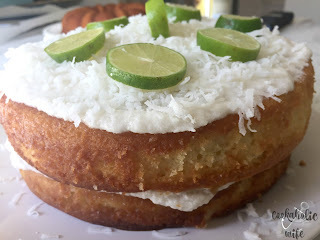 Sprinkle shredded coconut on top and then arrange lime slices on the frosting. 11. Slice and serve immediately or store in the refrigerator until ready to serve. * Cream of coconut is referred to as the solid portion when you buy a can of coconut milk from the international aisle. You can also find cream of coconut in the drink mix section but it is thinner and you’ll probably need to use less. If using the canned version, make sure to only scoop out the solids otherwise your frosting will separate. Isn’t this cake adorable? It came together so easily! 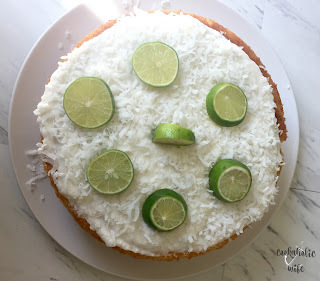 There is a mild lime flavor throughout the cake and then this sweet hint of coconut. Nichole, this looks amazing! Thanks for joining us. I sat out last month, too. Can't wait to try this cake. What a pretty cake!! I love anything key lime — this is right up my alley! Thanks for the great recipe! So happy that your cake turned out for you! I had the curdling problem with my ice cream last month too, but was lucky enough to have extra ingredients and time that I could redo it. This cake looks wonderful. Lime, coconut, and rum were made to go together! This cake looks so delicious. We don't key limes in Kenya. I'm n Canada visiting my son and have fallen in love with the taste of these limes. Love the aroma too. 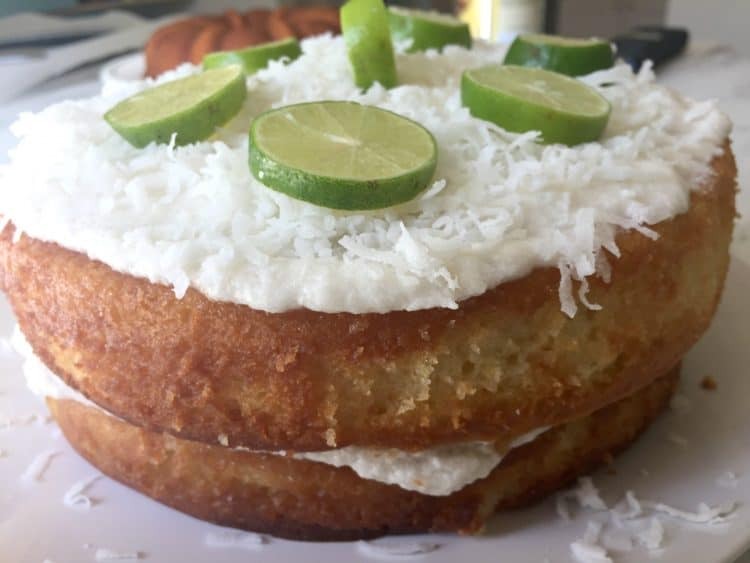 So can imagine the combo of coconut, lime and rum…. so tropical! I love this cake! Perfect for the theme. So happy you've joined us! Love that you used coconut rum. That is one gorgeous cake Nichole.